French, early 17th-century brown morocco gilt, line borders and frames with pear ornaments (monogram of Anne of Austria) at the corners, double-A monogram within a wreath in the center of each cover. Gift of Sharon G. Phillips and her children, Greer and Melissa, in memory of her husband and their father, Neil F. Phillips, Q.C., 1997. Probably executed for a Parisian patron; Anne of Austria, Queen of France (1601-1666), manuscript rebound in the early 17th century and stamped with her arms; Maurice Johnson of Spalding, Lincolnshire (1688-1755); his sale (London, Sotheby's, 21 March 1898, lot 573) to Tregaskis; Michael Tomkinson of Franche Hall, Kidderminster; his sale (London, Sotheby's, 3 July 1922, lot 1521) to Edwards; A. Chester Beatty, Western MS 84; his sale (London, Sotheby's, 24 June 1969, lot 69); Neil F. Phillips; Gift of Sharon G. Phillips and her children, Greer and Melissa, in memory of her husband and their father, Neil F. Phillips, Q.C., in 1997. Ms. book of hours, use of Paris; written and illuminated in Paris, France, late 1490s. Decoration: 3 miniatures with full borders, 10 additional fully illuminated borders. Artist: Master of Anne de Bretagne. The artist was named for his illustrations in the Très Petites Heures painted for Anne de Bretagne (Paris, BnF, ms. N. a. lat. 3120). 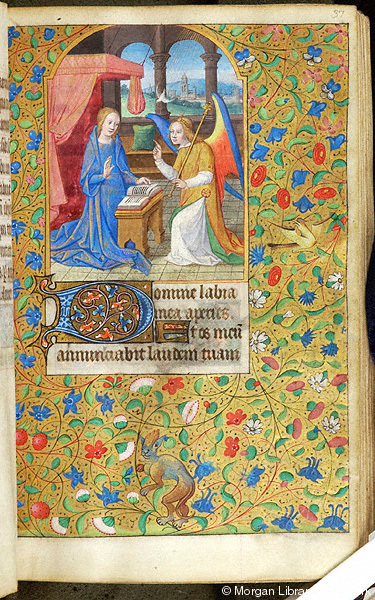 In addition to illuminated manuscripts, he also created designs for printed Books of Hours (including those of Philippe Pigouchet), stained glass (including a rose window for the Sainte-Chapelle in Paris), and tapestries (including the Hunt of the Unicorn series in the Cloisters, Metropolitan Museum of Art, New York). Hence he has also been called the Master of the Très Petites Heures d'Anne de Bretagne, the Master of the Apocalypse Rose, and the Master of the Hunt of the Unicorn. Without concrete evidence it has been suggested that the Master of Anne de Bretagne might be Jean d'Ypres, active ca. 1490-1508 (See Wolf, Kings, Queens, and Courtiers 142, no. 70). Missing single leaves, that may have included an additional two illustrations and the beginnings of the Penitential Psalms and the Office of the Dead, occur before fols. 125 and 168.